Krazy for Kats Kitty Love Story — KRAZY FOR KATS, INC.
That was all she had to say. I ran over to her home and found a beautiful mommy cat with babies nestled underneath the bushes and ivy. With my meager knowledge of catching a feral (wild) cat, I attempted to grab her with a towel so I could put her in a cat carrier. BIG MISTAKE! All I succeeded in doing was put mom in attack mode and then scared her off for hours! When she finally returned, we attempted to catch her again, but she was fed up with the human intruders and started moving her kittens to a safer location. I was completely amazed at how easily she scaled an 8-foot cement wall with a kitten in her mouth. She quickly took all of her kittens away. All but one… a little baby girl. Now, I don’t know if we handled that kitten too much or if she was sickly. What I do know was that I waited outside in the backyard until 3 am to see if the mommy cat would return for her last baby. When she didn't come back, I carefully bundled up this tiny creature and took her home. She was only a day old and I named her “Hanna Grace.” Hanna, after the street she was born on and Grace, for the grace of God I had in finding her. Hanna did very well for the first 4 days of her life. Then things took a turn for the worst. She became very ill and couldn’t eat. I rushed her to my vet, whom immediately insisted that she was too sick to survive and told me she should be euthanized. WRONG ANSWER! I took her to the emergency vet later that night and she received better treatment. It seemed that she had a strange mass in her stomach. I was sent home with a few words of encouragement, but not much hope. I didn’t sleep the whole night. The next day I felt I needed to have one last opinion. As I drove down the street I said in my mind, “If I see a vet’s office within the next 2 blocks, I am going in for a third opinion!” Sure enough, VCA Parkwood Animal Hospital in West Hills was on the next corner. The Dr. Hersberg took turns examining her and we realized that her baby formula was not digesting properly and that a new brand of food might help. I left with a positive feeling that if she could just make it through the next few days she would be all right. Well, to my amazement she survived! Baby Hanna went everywhere with me the first 6 weeks of her life and she has turned out wonderfully. She is now my mascot for Krazy for Kats! Hanna has even been to a seminar when she was 3 weeks old and met the beloved spiritual leader and famous author, Dr. Wayne Dyer! I attended many of Dr. Dyer's seminars over the years and he always remembered Hanna and the Kat Girl! 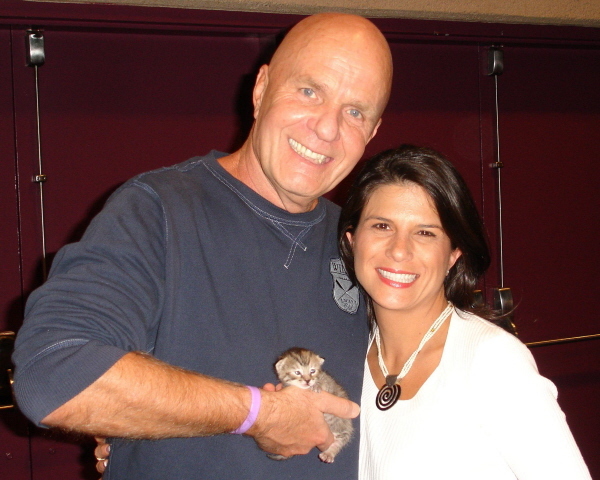 Spiritual Kitty Connections with Wayne Dyer! At VCA, the mananger put me in touch with a rescue group called “Best Friends Catnippers.” That is how my whole trapping adventure began. I was able to go back and rescue the three siblings and trap the feral mommy cat! I had her spayed and vaccinated after the kittens were weaned and then she was safely released back to her colony. I truly believe this wonderful mommy cat, whom I named Jasmine, found it in her heart to give me her baby girl as if to say, “Here is an opportunity for you to help those of us in need.” She also made it possible for me to find her again and rescue all her babies, which have now all been adopted out to good homes. I appreciate you for taking the time to look at these beautiful rescue kittens that I foster. They all deserve to be taken off the streets and out of the shelters to have a warm home to live in. They will come to you with a heart full of love and give you years of companionship.